Guardians of the Galaxy Vol. 2 has only been in theaters for a little over a week, but many fans are already looking ahead to the future. Specifically, to Guardians of the Galaxy 3. Luckily for fans of the franchise, we already know that director James Gunn is going to write and direct the third installment. However, he was hesitant to sign on and, in a recent Q&A, he revealed why. Warning: there are massive spoilers ahead for Guardians of the Galaxy Vol. 2. James Gunn took to Facebook yesterday to do a spoiler inclusive Q&A all about his recently released sequel. 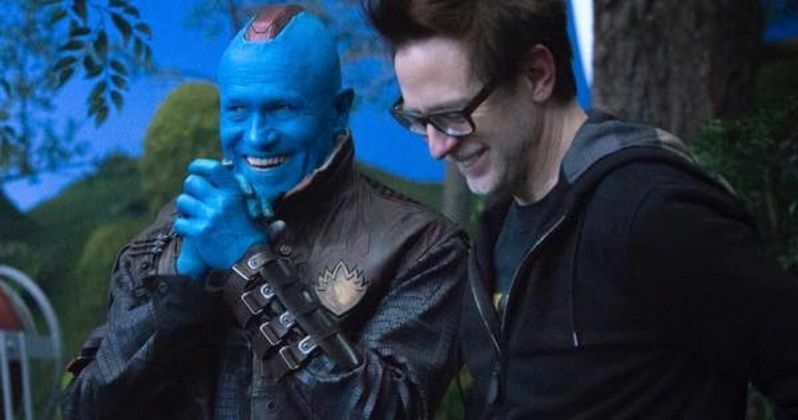 At one point, someone asked about Yondu's death in the movie and, as it turns out, that is why the director wasn't sure he would sign on for Guardians of the Galaxy Vol. 3. Here's what he had to say. "Let me tell you, there was nothing harder for me than the choice to kill Yondu in this movie. Michael Rooker, for all the crap I give him, is one of my closest friends in the world and the last thing I wanted to do was to make a movie without Michael Rooker in the future. I almost didn't do Guardians of the Galaxy Vol. 3 because there was no Michael Rooker in it and I couldn't see making the movie without him. He means that much to me and I love him that much." There are a couple of things that the MCU hasn't handled particularly well. One being villains, who are usually pretty one-dimensional. The other being deaths, since the majority of significant "deaths" have resulted in that character coming back to life or not really dying. In the case of Guardians of the Galaxy Vol. 2, Yondu's death was very much real and had true meaning. James Gunn went on to reveal that he really wrestled with the decision, but he ultimately felt that it was the right thing for the story. "[Killing Yondu was] the hardest choice I've ever had to make from a storytelling perspective. I wrote a bunch of treatments where Yondu did not die. There were other endings - he was saved at the last minute after taking the sacrificial stance, and I wrote many drafts like that. And I realized I was being dishonest. That was not what this story was. For me, the most important thing in making a movie is to tell the truest and most honest story possible, and that's whether you're making a $500,000 indie film or a $200 million dollar spectacle film. And the truth of this story, this was about a father's true and ultimate love for his son. This is a movie about, Who really are our fathers? Who really are our siblings? And the only way for it to be an honest story was for Yondu to die, and anything else would have been half measures, and would have been me backing out because I was afraid to tell the truth. And so that's why Yondu dies." Marvel fans are probably very happy that James Gunn is coming back for the third Guardians of the Galaxy installment, which is currently rumored for release in 2020. But Marvel Studios is probably, equally happy. Both of the Guardians of the Galaxy movies so far have done well critically, but they have also been monster hits at the box office. So far, Guardians of the Galaxy Vol. 2 has grossed $632 million worldwide. That is already approaching the total gross of 2014's Guardians of the Galaxy, which topped out at $773 million. James Gunn is arguably the most important factor in that success, so having him back should prove to be a good thing. You can check out the full Q&A for yourself below.